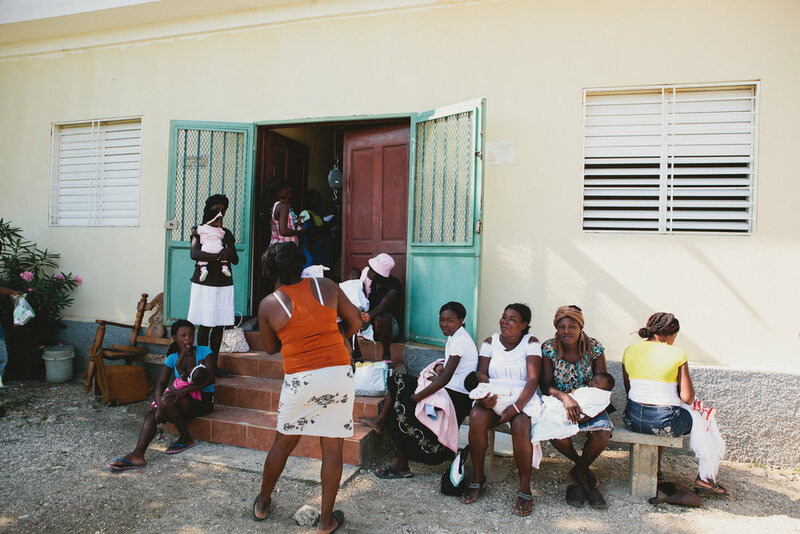 We support several projects throughout rural Haiti, including health clinics, schools, access to clean water, and various medical outreach programs. Our primary project is a community health clinic first opened in 2000 to serve the population of Dumay, a subsistence farming community northeast of Port-au-Prince with a population of about 20,000. The clinic currently employees a staff of 30 under the leadership of Dr, Jean Fritz Jacques. Support staff and nurses, all from local communities, help to keep the primary care clinic, pharmacy and laboratory open 5 days a week. Clinic programs include an eye clinic, vaccine clinics, family planning, prenatal and infant wellness programs, a nutrition program, clean water programs, an as needed cholera stabilization and re-hydration clinic. A small fee is charged for seeing a physician and receiving medications, and laboratory tests are conducted on the premises for only the cost of the test materials. If patients are unable to afford the minimal costs they are treated for free. Many programs are free to community members including the dehydration/ cholera clinic. In 2018, 9,134 patients were seen at the clinic, 374 minor procedures were performed, 2,462 patients were given vaccines and 5,810 laboratory tests were performed. 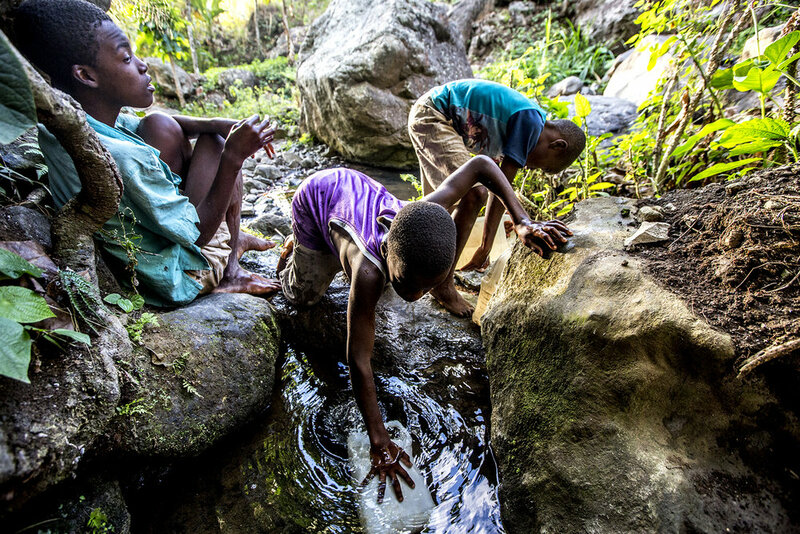 A primary building block for the health of any community is access to clean water. HAM has two programs that give the community access and educate them of the importance of clean water and we employ four water technicians in Dumay and two more in Demier. A point of use filtration system from our partner Gift of Water, is installed in over 1600 homes throughout the Dumay area, and in Demier there are another 100 systems installed. These simple systems involve two 5-gallon buckets and use charcoal and chlorine filtration to purify the water. Our water technicians visit homes where the systems are installed to make sure they are being used properly and to maintain and service the systems. Our second program utilizes a large volume ozonation purification system produced by Living Waters for the World and installed on the grounds of the Dumay clinic. Community members purchase a 5-gallon water bottle and have it refilled for about 22 cents. We also provide free bottled water to several local schools. The Noel Dusan Eye Clinic opened its doors in 2012 as part of the main clinic in Dumay. The clinic is open one week per month and offers complete eye exams, glaucoma and cataract treatment as well as distributing eye glasses and treating eye infections. In 2017 the eye clinic performed 837 eye exams, treated 214 patients for glaucoma prescribed 90 pairs of eye glasses and distributed 333 sunglasses throughout the community. The Charles Salomon Primary School is a cement block building located on the North coast of Haiti in the Part au Paix neighborhood of Baudin-Gros Sable. Healing Art Missions provides financial support of the staff of 18 teachers that are employed through the school where 358 children attend class from preschool into primary education. Most of the children in attendance live in impoverished area of the neighborhood and would not attend school otherwise. All teachers are certified and the curriculum follows that set by the Haitian government and includes math and science as well as reading and writing French. Classes are based on the grade level, not the age of the students, as many teenagers in the neighborhood are illiterate and are attending school for the first time. The CSP School also supports an adult literacy program serving over 25 adults. Demier is a small farming community made up of 400 families living in a remote mountainous area west of Dumay. There is no formal infrastructure in the hamlet accessed only by a 3 hour hike into the mountains. Healing Art Missions employs 2 community health and water technicians that help administer vaccinations and basic public health services within the Demier community that consists of only a church, school and homes. HAM has installed 100 water filtration systems which are maintained by the water technicians who also provide education about clean water and disease prevention. We also try to send a medical team to Demier once a year to hold mobile clinic. Medical missions trips generally take place four times a year, composed entirely of volunteers who pay for their own expenses, including travel. While medical professionals often make up much of the teams, others with specific skills, knowledge and expertise are often involved to help share and develop their talents through the challenges and perspective-changing environment of Haiti. Our philosophy for working in Haiti is to provide employment for Haitians in a country where the unemployment is 80%, so our volunteers work along-side Haitians. Volunteers do not constitute cheap labor, they are partners with the community working, sharing and learning with people from a very different background and perspective. Through such experiences, HAM volunteers often discover a deep connection with the complex world that is Haiti and become ambassadors advocating for Haitians and HAM. Teams to Haiti are composed of volunteers who go not to do-for but to do-with the community, to supplement the Haitian medical professionals working at HAM’s Centre de Santé Communautaire de Dumay and to share their knowledge and experience with the population, as well as to learn. Past HAM missions have involved the creation and development of our medical clinic in Dumay, as well as mobile medical clinics to various other communities in Haiti including Cite Soliel, Croix-des-Bouquets , Delmas 33, Demier, Gran Ravine, Jacmel, Leogane, Penier, Petionville, Port-au-Paix, Port-au-Prince, St. Marc, and Warf Jeremie. Non-medical teams have been involved in a variety of projects including the installation of solar collection and storage systems, IT installation, clean water projects, various building projects, organizational systems, and education. Beginning in 2017, two nurses from the Dumay community trained for one year with Midwives for Haiti in Hinche. They graduated in 2018, and started our safe birthing program, offering comprehensive prenatal and postnatal care, along with 24/7 delivery options. In April, 2019 we hired an OB/GYN from Croix-des Bouquets to help care for high risk patients and manage surgical care for both OB and Gyn patients. Healing Art Missions contributes to much more than the clinic in Dumay. Pays the yearly office rent of a Croix-des-Bouquets based social justice organization Conseil Communautaire pou la Protection et la Defense des Droits Humains (CCPDH), based in Croix-des-Bouquet, that partners with the people of Dumay to help lower crime, fight corruption and improve community safety. Centre de Santé clinic is an officially sanctioned Emergency Response site by the Haitian government, including USAID sponsored early warning siren for flooding and hurricanes.